There is nothing on Earth as complex as the atmosphere. I’ve said that many times, but it’s probably meaningless words to most. Here’s where time lapse video (below) makes the difficult easier to see! The atmosphere and humans run on different time scales. We don’t notice the atmospheric changes constantly taking place. A few things to note. The low clouds that dominate the beginning of the video are associated with the marine layer. This is a very dynamic layer. Clouds are forming and fading constantly. 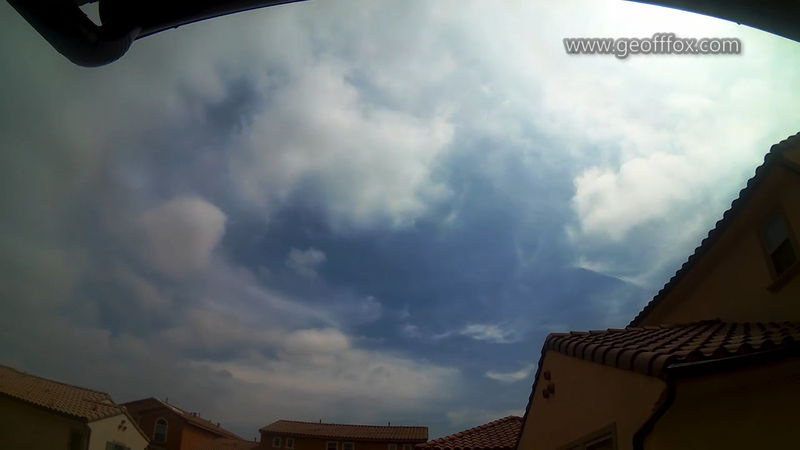 Usually the marine layer leaves my part of Orange County around noon, which is what happens in the video. As the low clouds fizzle they expose a high deck of cirrus clouds, formed mainly of ice crystals. This higher layer looks much more stable. All the atmospheric physics that produced the clouds happened upstream. We’re just seeing transport as the clouds are propelled by light upper air winds. It’s very cool to see this laid out before us. Hi Geoff—From the Morris Cove Seawall, we called the fog rolling over the harbor, “sea smoke”. Is this a type of marine layer? Sea smoke happens when the water temperature is lower than the dew point. The air at the water’s surface condenses forming the fog you see. Thank you for sharing I found this very interesting…I do love watching the clouds roll in and do all the things they do. I love weather! This is so cool. It seemed odd, though, to never see a bird (or plane) in all that time lapse. Is it because it’s been so condensed it’s too quick for me to see? Yes — this is around 60:1, so it would be unusual to see a random event. That was cool! A weather lesson! I like that! Thanks Geoff! Any comment, as Trump exits the Paris climate agreement?